This is a game that will test your reflexes - it's highly addictive and a must for car game freaks. It sure captured my attention and should capture yours. 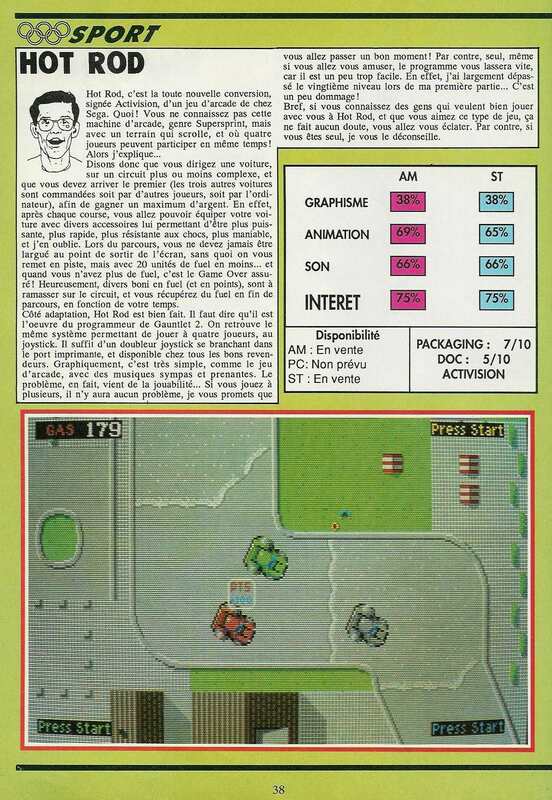 Bref, si vous connaissez des gens qui veulent bien jouer avec vous à Hot Rod, et que vous aimez ce type de jeu, ça ne fait aucun doute, vous allez vous éclater. Par contre, si vous êtres seul, je vous le déconseille. Graphically Hot Rod is very pretty, although the main sprites are blocky. Sound consists of an annoying tune that numbs the mind. This isn't the strongest Sega title that Activtsion have released, though it isn't the worst either. Hot Rod is a pretty nifty Super Sprint clone, but it lacks the polish to make it a great game. Graphically it's nothing special - the cars are basic and the backgrounds don't show much imagination; sound, too, is limited to monotonous music and some feeble burms. The real problem is the map design; some of the corners are just too tight to avoid, and if you slip behind the leader or bump into an obstacle it's almost inevitable that you'll lose gas catching up. As a single player game it's not tops, because most of the computer opponents are thick and you end up just having to beat one. The multi-player mode rescues it from obscurity though - if you've got a four-player adapter, you get the fun of competing against equals. The sound is quite reasonable, adding something to the overall appeal of the game. The graphics are colourful enough, but again they are not amazing. Generally the game is unremarkable but if you did like the arcade game or you have a soft spot for racing games as a genre then you are likely to find it pleasurable for a while. The trouble with Hot Rod, besides the idiocy of the repositioning business, the feeble squeaks from the speakers, and the depressingly bland graphics, is that it is just far too easy. After 17 or so levels, on only my second go at that, they start to repeat themselves as well. With three friends taking part it does become more competitive in a brutish and crude sort of way, but as a one player game Hot Rod can only be considered as a cure for insomnia. Even if you cannot drive a formula one racing car while using a Z88 I think you will find this far too easy. The arcade original was pretty simplistic and, as might be expected, the conversion is accurate. Sadly, the arcade machine was not much cop, and that also comes across in the conversion. The graphics and sound are mildly cheering, but the gameplay is thin and watery. Even with four people it palls after a short while. Hot Rod is an accurate but dated conversion which lacks playability. Im Vergleich zu seinen vollblütigen Stall-Genossen ist der Sega-Spielautomat "Hot Rod" eher ein biederer Typ. Keine aufwendige Hydraulik, keine rasend schnelle 3D-Grafik – nein, einfach nur ein 2D-Autorennen ohne viel technischen Aufwand. Four-player option is novel but there's no attract mode. Unadventurous use of colour for backdrops and dull track layouts. Not one of Benn Dalglish's best title tunes. Not so hot FX either. The more players the more fun but there isn't a lot to the gameplay to start with. The limp 'difficulty' level makes it an easy game to get into... ... but too easy to continue with. Complete all 15 courses and you're very unlikely to carry on. Slow paced, repetitive racing action that was done far better in Super Sprint. Trotz der mäßigen Präsentation ist Hot Rod bei mehreren Mittspielern noch ganz spaßig - wer sich alleine davor setzt (und keine absolute Joystick-Niete ist), kann davon ausgehen, daß er schon sehr schnell alle Level durchgespielt hat. Ich frage mich, wie es die SEGA-Leute wohl geschafft habe, die Zocker damals vor ihren Automaten zu kriegen. Irgendwie muß da einiges anders gewesen sein. HOT ROD ist als Computerspiel jedenfalls ein Reinfall. Wer auf die Vorgänger und Vorbilder Supersprint und Super Cars zurückgreift, ist eindeutig besser bedient. Makes Badlands look like a classic. Seul intérêt, l'option qui autorise le jeu à 4 simultanément... un peu léger.